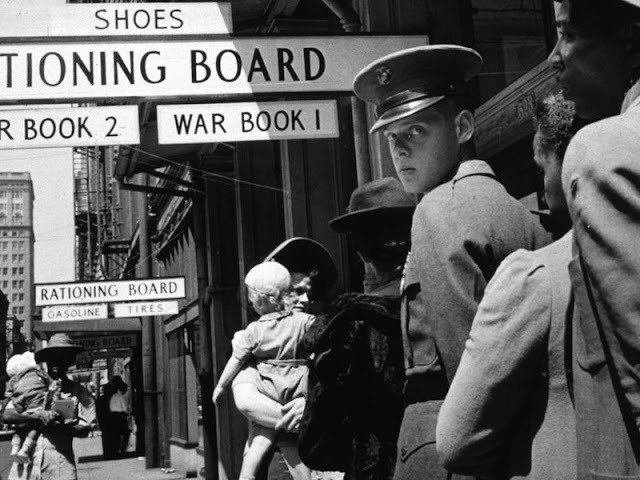 During World War II, Many Items Were Rationed in the United States, Including Shoes! 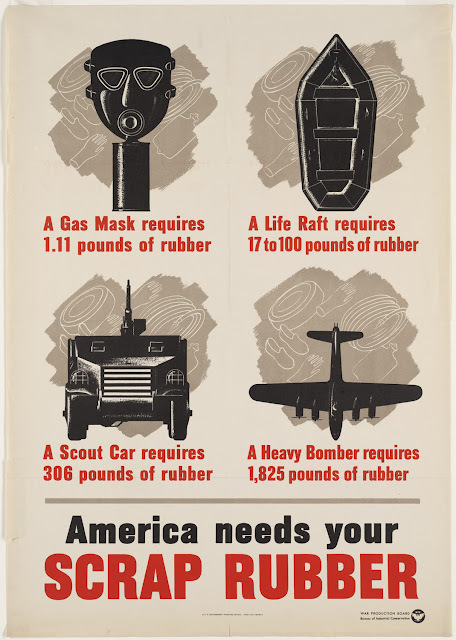 During the Second World War, you couldn't just walk into a shop and buy as much sugar or butter or meat as you wanted, nor could you fill up your car with gasoline whenever you liked. All these things were rationed, which meant you were only allowed to buy a small amount (even if you could afford more). 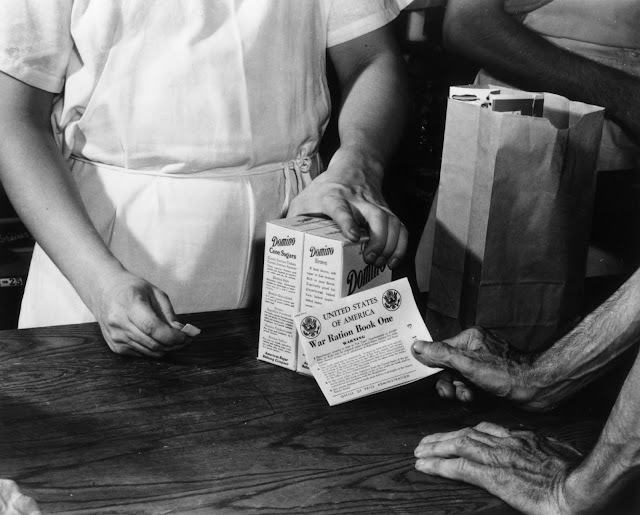 The government introduced rationing because certain things were in short supply during the war, and rationing was the only way to make sure everyone got their fair share. 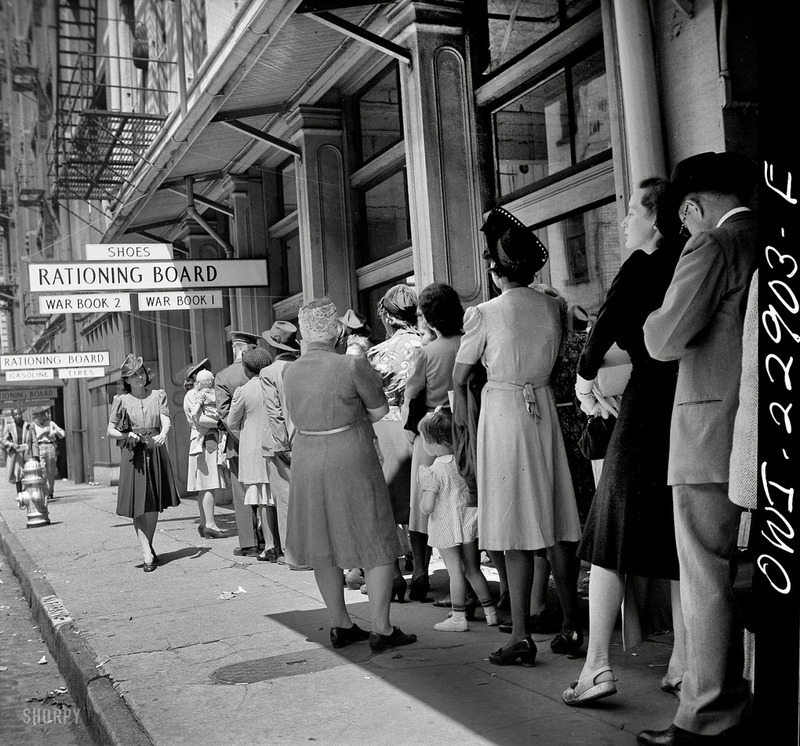 Line for the Rationing Board on Gravier Street, New Orleans. 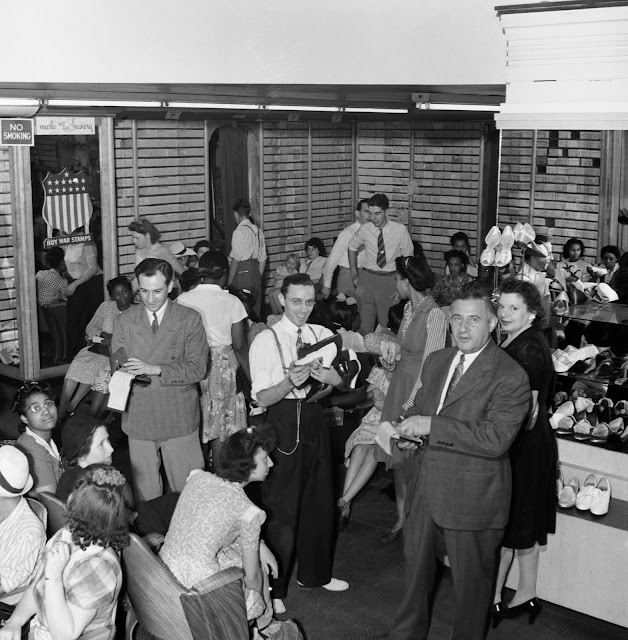 The Shoe Line: 1943 March. New Orleans, Louisiana. Line at rationing board. 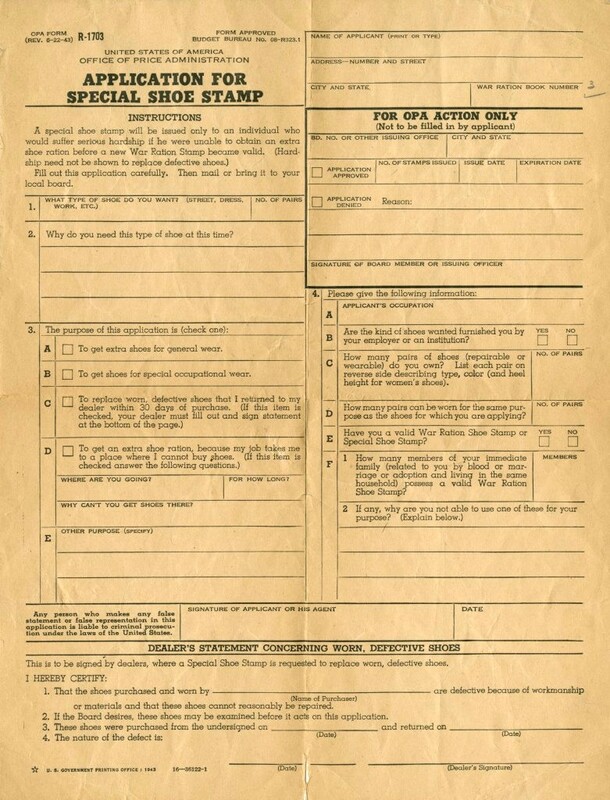 Starting September 30, 1942, men's rubber boots and rubber work shoes were placed under rationing. 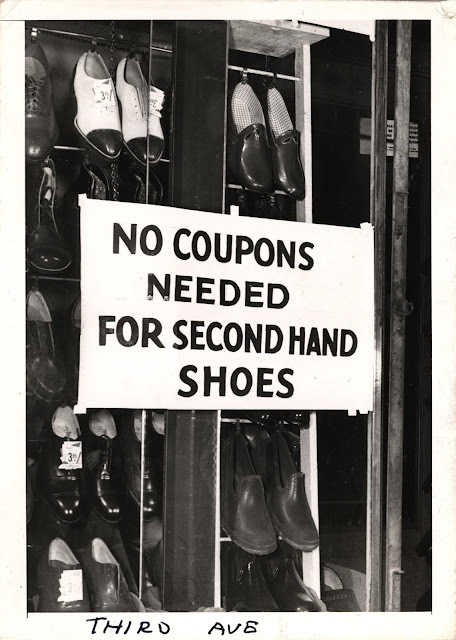 To obtain a new pair, a man had to apply to the local ration board, prove he needed the shoes for essential industry—not for sport—and turn in the old pair. Galoshes and overshoes were not rationed because they used less crude rubber, but sportsmen couldn't get boots, and sneakers were no longer produced. 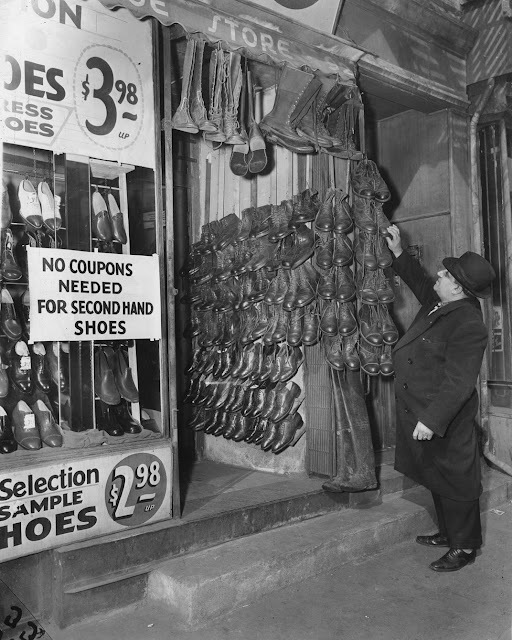 On February 7, 1943, the United States instituted rationing of leather shoes to begin on February 9. Each man, woman, and child could purchase up to three pairs of leather shoes a year, using designated stamps in War Ration Book One, and later in Books Three and Four. To simplify the system, only six shades of leather were produced. However, the supply of leather continued to decrease. 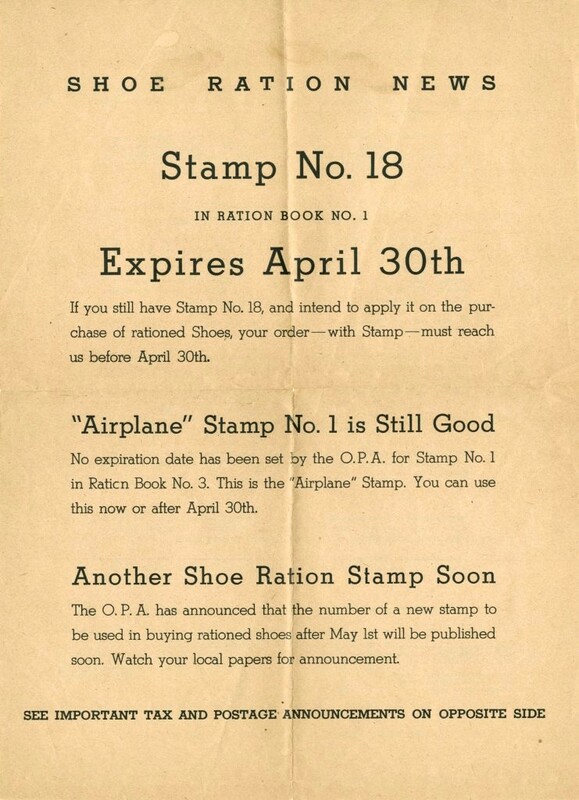 On March 20, 1944, the ration was reduced to two pairs of leather shoes per year. Shoe rationing continued until October 30, 1945. 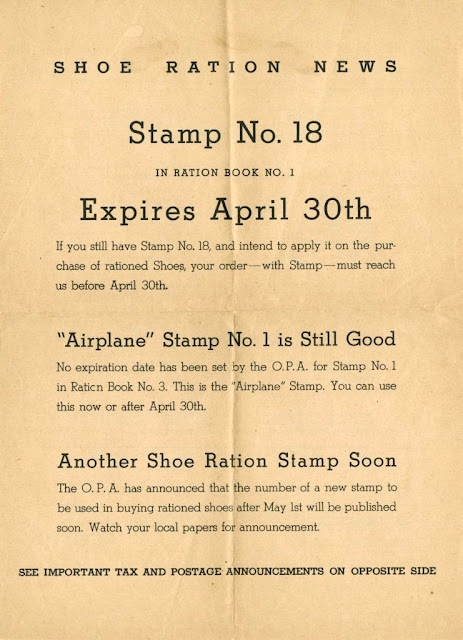 The strict rule that the ration stamp had to be torn from the book in the presence of the retailer was lifted for catalog purchases. 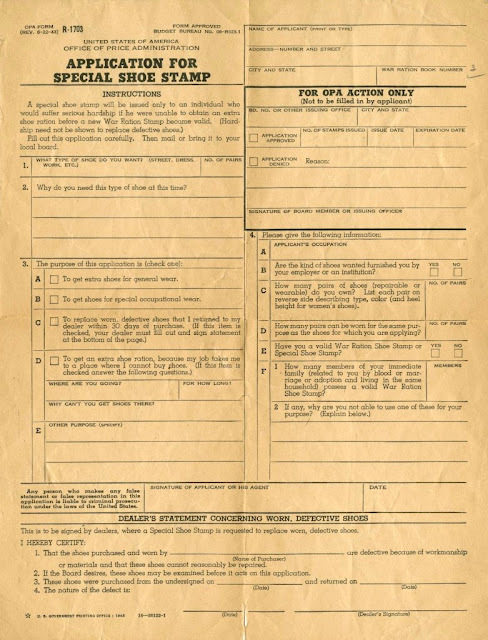 If you wanted an extra pair of shoes, you had to fill out a long application at the ration board, listing every pair of footwear you owned, and explaining why another pair was essential for your occupation and why another pair was required to prevent serious hardship. To make do with less, people took care of the footwear they already owned, keeping rubber boots clean, dry, and away from excess heat or cold, and repairing shoes and boots whenever possible. Shoes made of fabric, such as espadrilles, were not rationed and became fashionable. Women also turned to fabric purses and belts. Some people did not make do. Theft and black market profiteering were a continuing problem. For example, on May 3, 1944, a man was arrested in Pittsburg, California for stealing seven pairs of shoes from a shipment. The June 8, 1944 issue of the Antioch Ledger reported his sentence—six months or $500.